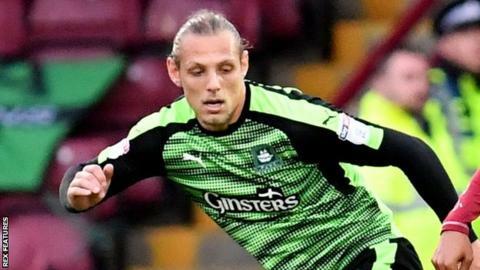 Defender Oscar Threlkeld hopes to stake a claim for a regular place in the Plymouth Argyle side after scoring in his first appearance since rejoining. He scored in the 5-1 win over Rochdale and could benefit from an impeding two-game suspension for Antoni Sarcevic. "It's one of those where I've got to knuckle down in training again and say in my head that I am playing. "If I'm not playing that's up to the gaffer, but it showed today that I am ready to play," he told BBC Devon. The 24-year-old returned to Home Park in January on loan from Belgian side Beveren, having left last summer. And since then Argyle's form has taken a turn for the better - they have and won six of their nine matches in 2019 and lost only once. "I'm trying to get some minutes, it's been a long time coming, but I couldn't get in the team because we were playing so well and winning games," Threlkeld added. "I had to wait for my chance, I knew it as coming, I spoke to the gaffer about it and he said I needed to sharpen up in training and obviously it's paid off."